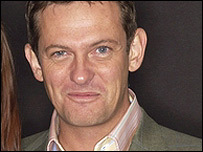 The girlfriend of TV presenter Matthew Wright has told how she was a victim of a "happy slapping" attack. Caroline Monk, 35, who lost her hair during treatment for breast cancer, was called a "slaphead" and knocked to the ground by a gang of teenagers. The couple have decided not to report the crime in Primrose Hill, north London, for fear of reprisals. "Happy slapping" is a new crime phenomenon where gangs attack random victims and film it on mobile phones. Ms Monk, who describes the attack in her column in Closer magazine, had been walking with her 60-year-old mother when a boy ran at her with his arm outstretched and knocked her to the pavement. She said: "I was lying on the ground and all the other lads were running up, pointing at me, shouting 'slaphead, slaphead'." She said she started crying and shouted at the teenagers that she had cancer. Some, she said, muttered an apology. Matthew Wright, who presents Channel Five's The Wright Stuff, said: "When people go around torturing and abusing people with cancer, it makes you wonder what kind of world we live in." Ms Monk, who has been with Matthew Wright since 2003, has undergone chemotherapy and radiotherapy after she was diagnosed with breast cancer last September. A Scotland Yard spokesman said "We would always encourage people to come forward and report crime. "Everybody has to make their own decision based on their personal circumstances but it's our job to try and protect people."